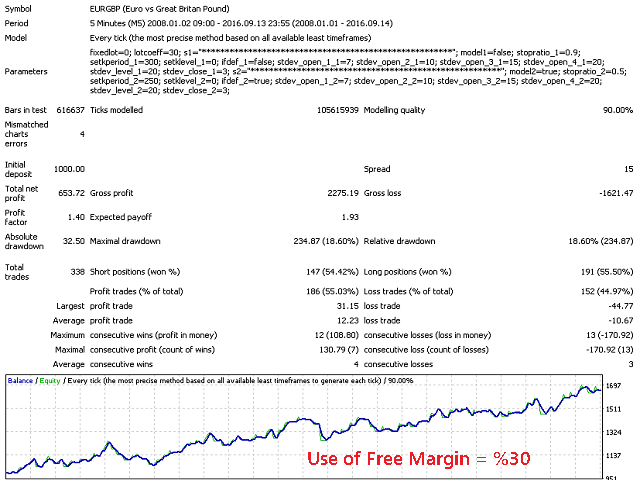 Bin is a hybrid robot, that can behave like a scalper and also a trend follower. For best results, use 3 or more currencies. 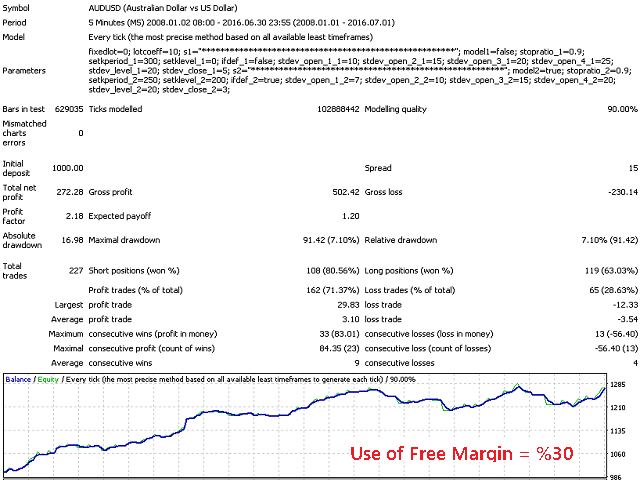 For micro lot (0.01) and 1/100 leverage, you can start with 150 USD for each currency. Strategy; Uses momentum to decide market direction. Life time for any position can vary from some minutes to days. Bin behaves like a scalper when there is possibility to make profit in short time, or waits for some days like a trend follower. Multi Currency; Choose best performing pairs and create your portfolio to minimize drawdown and maximize profit. Risks; No grid, No martingale. Built in money management module. Expandable; Appropriate for big amount investments / funds. Opens the position in many pieces at the same price. Slippage; Slippage is controlled internally, no settings for the slippage. Slippage is allowed to a certain limit. Small slippages are not a concern. 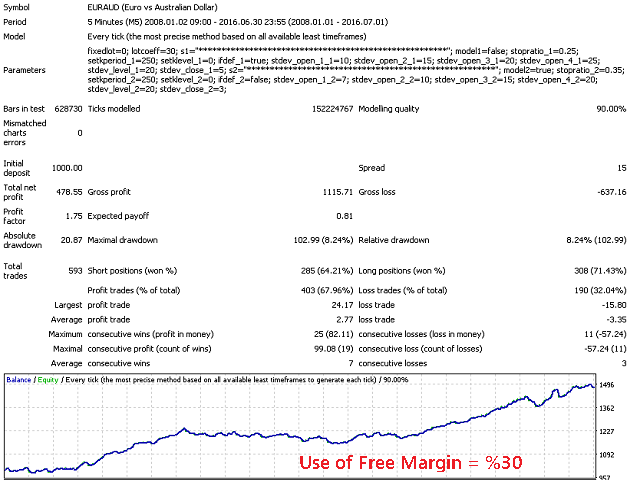 Broker Requirements; No sensitivity to Broker settings, Spreads, and Commissions. There is no requirement at all. Logically, lower costs will make more profit. So try to get the best spread+commission rates. Function Choice - There are 4 different modes. Type 1 is most aggressive algorithm. Use fixed lot - If set to "0", lot size will be handled automatically. If not set as 0, Bin will use the input value as lot size. 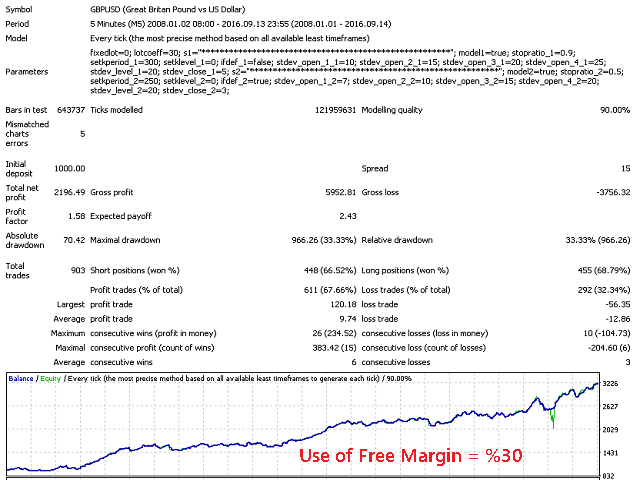 Use of Free Margin - This parameter is for the allocation percentage of the free margin of your account. Value has to be less than 100 in means of percentage. 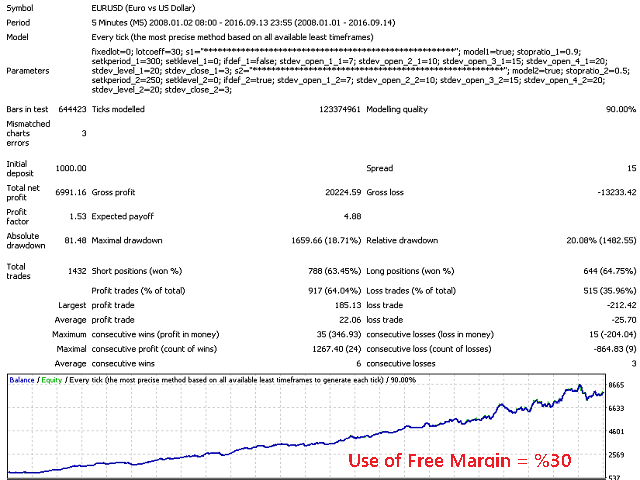 Do not forget to tune it according to your account leverage to control the drawdown. ON / OFF - You can use 2 different time frames at the same time. This switch is for the first time frame. Stop Loss Level - This is a constant between 0.1 and 1. Stop Loss level is calculated by support levels. With this parameter, you can make the stops closer to opening price. For example, 0.5 means the distance of stop will be half. Filter 1 Level - CCI based algorithm parameter for filtering. Minimum value is 0. Lower values forces the robot to be more aggressive. Filter 2 Level - Same as above. Maximum spread value is added to settings part. It is 35 by default, which is still safe for small fluctuations of market. When the market exceeds 35 spread value for the Symbol that yoy are trading on, BIN waits for 45 minutes before activates itself again.